The Arena of the Ages is a Nintendo DS exclusive area where you can raise and battle monsters. However you must have made a save to access it. You can go to it at the End of Time or at the title screen. You can give items to your monster in training and battle. You don't need the Arena of the Ages to beat the game. It's just a fun way to get items. Begin by entering the arena. Talk to the stable master. After telling you about the arena, he allows you to choose a smidge for your very first monster. There are 4 different Smidges to choose (Orange=Fire,Blue=Water, Yellow=Lighting, Purple=Shadow). Choose the one you like the most, and the stable master will give it to you and all the others will go. Additional to the Smidge you will also receive "Monster Trainer's Starter Kit" which contain Slops, Flameclaw, Duskeye, Seafang, Luxwing, Hawk Talon, Shield Cloak and Feral Wrath. Training allows your monster to grow stronger and more powerful. Depending on the item you give it, and the time period you select for it, a number of things could happen. Your monster could return with an item, have learned a new tech, or even evolved into a completely different monster. Bring up the monster display screen and select "Train Monster". Then choose an item and a time period and your monster will go to train. Training usually takes about ten minutes and it will not come back unless you are not there (when you enter next time, the stable master will call you over and you can see it return). The time period you select shows what type of training your monster is going to get, so try each one and see the raises (and decreases). For instance, 2300 A.D. primarily raises accuracy and stamina but decreases magic and trust. Slops 100 G Restore some HP. Flameclaw 200 G Unleashed Fire-based Tech. Seafang 200 G Unleashed Water-based Tech. Duskeye 200 G Unleashed Shadow-based Tech. Luxwing 200 G Unleashed Lighting-based Tech. Hawk Talon 400 G Temporary raise STR by 5. Shield Cloak 400 G Reduce Damage by 1/3. Feral Wrath 500 G Boosts Critical by 4x. A Nu will sell items that is for use with your Monsters. This is really easy if you have access to Antiquity (12,000 BC). The monster you have will battle automatically. 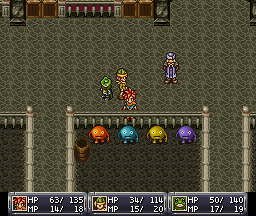 During the battle, you can give your monster an item, but once you give it to your monster, you can't get it back. You can replace an item with another, but the previous one will be gone. Whether or not the item is used by the monster depends on its Trust stat. If its high, then it may use it immediately, but if Trust is low, then it may ignore the item and never use it. If you lose a battle, then you'll receive a Potion. If you manage to defeat Ouroboros, then chances are high to receive a rare item (like Workman's Wallet, Capsules, Mirrors, etc), but also a crappy item like Mop. If you manage to defeat R-70Y and Deathguard, then chances are high to receive a rare item (like Workman's Wallet, Capsules, Mirrors, etc), but also a crappy item like Mop. If you manage to defeat Dokra and Uberhulk, then chances are high to receive a rare item (like Workman's Wallet, Capsules, Mirrors, etc), but also a crappy item like Mop. Once your Smidge changed class, then Tier 4 will appear and Tier 1 will disappear. Once your monster changed class twice, then Tier 5 will appear and Tier 2 will disappear. Once your monster changed class for the last time, then Tier 6 will appear and Tier 3 will disappear. This page was last edited on 27 December 2013, at 07:12.